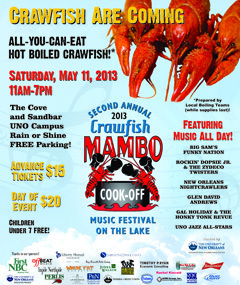 Thousands of revelers are set to fill the University of New Orleans Cove and Sandbar on May 11, 2013 for the Alumni Association's 2nd Annual Crawfish Mambo Cook-Off & Music Festival on the Lake. $15 advance tickets ($20 at the door) get you eight hours of live local music starring Big Sam's Funky Nation, Rockin' Dopsie, and many more; all-you-can-eat boiled crawfish prepared by 25+ teams competing for the coveted Best of the Boil championship title; and a host of food and craft vendors! Think your boil's best? Prove it! Enter to compete or just have fun at this uniquely New Orleans food-and-fun-filled festival. Visit crawfishmambo.com for team and vendor applications, sponsorship opportunities, to volunteer, buy tickets, or to learn more. Tickets are also on sale at First NBC Bank branches and the UNO Federal Credit Union. We can't wait to Mambo with you! • Is recognized for his/her outstanding accomplishments in his/her chosen field or other areas of endeavor. Help build UNO pride by nominating an alum whose successes and contributions bring honor to his or her alma mater. Click here for a downloadable nomination form. Submissions are requested by April 25th. John Williams, who has served as interim dean of the University of New Orleans College of Business Administration since August 2010, has been officially appointed dean of the college. Williams was one of three finalists for the position selected from a nationwide search. “I am confident that Dean Williams will provide the leadership required to enhance the College’s internal operations and continued engagement with the greater New Orleans community,” said Provost and Vice President for Academic Affairs James E. Payne. In keeping with the classic work hard/play hard tradition of New Orleans, the UNO International Alumni Association proudly presents two upcoming events in support of both! On April 11th, 12th, and 13th, laugh the night away with amazing comedy veterans Steve Rannazzisi (Star of FX hit "The League"), Neal Brennan (Co-Creator of the legendary "Chappelle's Show") and Chris D'Elia (Star of NBC hit "Whitney") respectively as they tape their one-hour specials for Comedy Central. FREE tickets are available courtesy of Comedy Central here. Please choose "UNO" as a reference so we can prioritize your emails. When it's time to get serious, UNO alumni are invited to take advantage of the exclusive Recruit New Orleans Alumni Only Career Expo on May 9th from 11 AM - 3 PM at the Superdome. The expo is open only to graduates of New Orleans colleges and universities including UNO, Tulane, Loyola, Xavier, and more. Whether you're looking for a new career or looking to hire the talent that is, Recruit New Orleans is where you'll find all the best opportunities, employers and employees. Click here to register as a job seeker or here to register as an employer. University of New Orleans alumnus (BA 95) and adjunct jazz studies instructor Kelvin Harrison led the KIPP McDonogh 15 Middle School band to a $6,000 second-place victory in the annual Class Got Brass brass band competition sponsored by the New Orleans Jazz & Heritage Foundation. Harrison teaches music full-time at the KIPP McDonogh 15 Primary School for the Creative Arts. The prize money will be used to buy new instruments for the school. Share your own story through AlumNotes or alumni@uno.edu. Alumni Association President Norma Jane Sabiston Rocks! Our Alumni Assoiciation president is a Rock Star! Norma Jane Sabiston will be celebrated tonight as City Year's 2013 School House Rock Star. The national nonprofit, along with New Orleans mayor Mitch Landrieu and his wife Cheryl, will honor Sabiston for her work toward advancing education in the city at the organization's annual fundraiser at Rosy's Jazz Hall. Click here to purchase tickets. Sabiston is a government relations expert and political consultant who took the helm of the Association in August. Responding to Louisiana's growing digital media industry, UNO's Department of Computer Science is offering a new concentration in game development. "The pervasiveness of computer gaming on personal computers, game consoles and handheld devices has generated significant student interest and job opportunities after graduation," said Mahdi Abdelguerfi, professor and chair of computer science. "This new concentration has the potential to attract new talented students to our computer science department."